GP – RN > Considers BreXit Cost Predictions re: Autumn Statement. 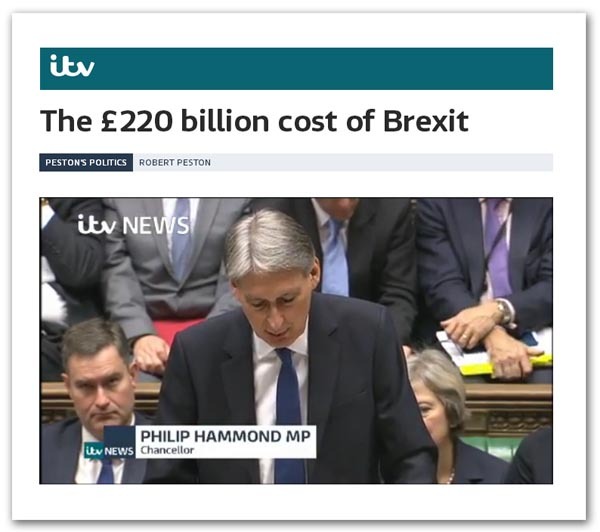 If you feel inclined to take the word of ITV’s Robert Peston, the cost of Brexit has just soared to £220 billion. Even less extravagant estimates put the cost at close to £60 billion over the next five years. Given that Vote Leave was looking to save £350 million a week from Brexit – and there are unlikely to be a compensatory savings from reduced contributions to the EU, it is beginning to look as if their “side of the bus” slogan might qualify as one of the most egregious campaign lies in recent history. However, the remnants of Vote Leave, rather than hanging their heads in shame, are picking up Nick Clegg’s contradictions over membership of the Single Market, while supporting an exit option which – if the Government was foolish enough to adopt it – would ensure that Brexit cost a great deal more than even £220 billion. Fortunately – as Pete points out – we didn’t vote on the money issue. And while that, in itself, is enough to render the Vote Leave campaign a waste of space the likelihood is that the were expressing an anti-establishment sentiment, with the EU taking the hit primarily because it had the support of the establishment. That does not in any way negate the referendum result – for good or bad, that’s the way the country voted. Short of Richard Branson’s shock troops forcing a second referendum, we’re on our way to redefining our relationship with the EU. Whether that actually means we leave the EU remains to be seen. Brexit may mean Brexit, but there are graduations to the process which means that we could end up still in the EU for a long while yet, as a convoluted transitional deal takes effect. Perversely, the “zealoteers” who are intent on blocking continued participation in the Single Market via the Efta/EEA route are making this fudge more likely. If we can’t get a clean break by switching over from the EU to the EEA, then Mrs May could be forced to keep us in the EU for the transitional period in order to give us the trade deal that we need. The ridiculous thing about all this though is that there never were going to be any short-term savings from leaving the EU and the best we could ever have hoped for was the cost-neutral switch offered in Flexcit, based on continued membership of the EEA. Under this plan, the primary aim for the longer-term was not to deliver any savings as such, but to improve the UK’s trading position and thus enhancing economic performance. Now, for the short- to medium-term, it looks as if we must take an economic “hit”, although there will be an ongoing debate as to how much of that is attributable to the Brexit which has yet to come, and how much was going to happen anyway. In the nature of things, this is something we will never know – making ideal conditions for endless argument. But the fact is that, unless we have a vision for improving our trading performance – on a European and global level – and the determination to push through the necessary changes, Brexit is going to be seen as a “catch-up” exercise. It is going to be portrayed as a struggle to make good the position we would otherwise have gained, according to whichever pundits have the ear of the media. As regards that “vision”, it is quite clear that we have a long way to go, witness the facile piece from one commentator who expected Hammond, in his autumn statement, to deliver it. Rather, the vision should have been central to the Brexit campaign. The lack of any unifying theme and the reliance on claims of cost-savings as the core element of the official campaign represents its greatest failure. Expecting the Government, headed by a former remainer, to offer a vision is rather like expecting the police to reduce crime. And the current Labour opposition is clearly in no position to fill the void, witness the toe-curling performance by shadow secretary Rebecca Long-Bailey (from 3:37), displaying a lack of knowledge all too typical of MPs (along with Andrew Neil who seems equally confused). Nevertheless, the lack of a vision as an issue will not go away. The referendum was only a means to an end and the exit campaign, which started in the 1970s, will not be over until we are fully out of the EU. We want more than a fudged exit, leaving us enmeshed in the Union with no clear direction for the future. This lack of vision will cost us a great deal more than money.